Windies were no match to India in the first Test as the home side claimed a 1-0 lead in the two-match Test series at the Saurashtra Cricket Association Stadium in Rajkot on Saturday. After Indian batsmen piled up 649 for 9 declared in their first essay, Windies only managed 181 and 196 runs respectively in their two innings as the game got over in approximately two and a half. The victory margin of an innings and 272 runs is India's biggest ever in Test cricket. Earlier this year, they thumped Afghanistan by an innings and 262 runs in their debut Test in Bengaluru. Meanwhile, for Windies, this was their second biggest defeat in Test cricket and biggest against India. The last time Windies (then West Indies) beat India in India was in 1994 and since then they haven't managed to pick up a win in the nine Tests that they have played in this country. 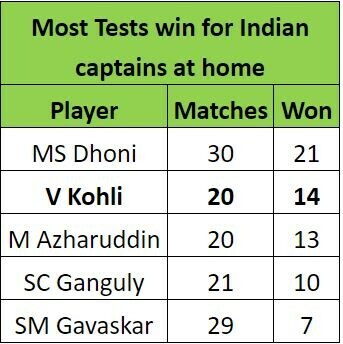 As a captain, Virat Kohli now has 14 wins in India and is only behind MS Dhoni (21 wins) in the list. This match also proved out to be a special outing for Kuldeep Yadav who picked up his maiden five-wicket haul in the five-day format. The left-arm wrist spinner returned figures of 5 for 57 in the second innings and became only the second India after Bhuvneshwar Kumar, and seventh overall, to claim five-fers in all three formats of the game. The 23-year-old got his One-Day International and Twenty20 International five-wickets hauls in England this year, making him the first bowler to achieve this feat in the same calendar year. * This was India's 100th win at home - fourth team to achieve the feat after Australia, England and South Africa.. They have played 266 Tests on home soil, of which they have lost 52 and drawn 113, while one game ended in a tie. * India took a first innings lead of 468, which is their third-highest after 492 against Bangladesh in 2007 and 478 again versus West Indies in 2011. * This was the eighth time India have breached the 600-run mark under the captaincy of Kohli. The second best being five times - under Allan Broder, Sourav Ganguly, Graeme Smith and MS Dhoni. * Debutant Prithvi Shaw was awarded Man of the Match for his scintillating 134. Shaw became the sixth Indian to do this after Pravin Amre, RP Singh, R Ashwin, Shikhar Dhawan and Rohit Sharma. * This was the 400th instance of a team winning a Test by an innings margin. India have done it 42 times, but are still behind the likes of England (104), Australia (91) and South Africa (46). * Total of 20 sixes were hit in this match, which is the joint-most in a Test in India. The same number of maximums were hit at the Brabourne Stadium in 2009 in a Test involving Sri Lanka.